Will Congress act in time to help Maine’s 73,000 disabled workers? Claire El-Hajj, 63, and her husband Lonnie El-Hajj, 60, met in 2011 when Lonnie asked Claire about her dogs in a Bangor park. They are both disabled. Claire has been unable to work because she has multiple sclerosis and Lonnie has to use a wheelchair due to a stroke he suffered in his late 40s. They have to make ends meet on money they receive through Social Security disability insurance. Come December 2016, nearly 11 million disabled American workers and their families will see sharp cuts in disability benefits unless Congress acts to replenish the Social Security disability trust fund, according to a recently released report from the Social Security trustees. The disability program provides financial assistance for workers and their families when a medical condition prevents them from working for at least a year. In Maine, 73,470 people (including workers, spouses and children) relied on the disability program in 2013 — a figure that has risen more than 28 percent over the past decade. 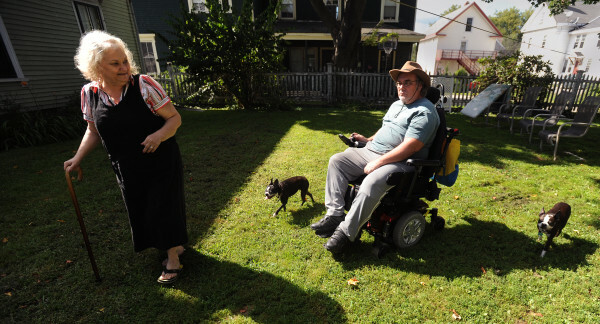 In 2004, 57,229 Maine people depended on the disability lifeline. In 2009, the number reached 67,905. The growing number of people drawing down disability benefits — nationwide, the number increased 38 percent between 2004 and 2013 — has overburdened the program. Last year, the disability insurance program brought in nearly $114.9 billion from payroll taxes, far less than the $145 billion it paid out. Ordinarily when this happens the trust fund covers the difference. But the trust fund has had to cover an imbalance every year since 2009, so it’s on the verge of running out. If that happens, the Social Security Administration will only be able to pay 81 cents for every $1 of promised benefits. So Mainers receiving the average disability payment, $919.79 a month, would see their disability checks shrink by $174.76. The U.S. economy’s plunge into recession in 2007 has been cited as one reason for the growth in disability rolls, but the growth has been fairly steady across the country for the past three decades. With greater competition for fewer jobs, many disabled workers who lost their jobs and had trouble returning to work started collecting disability benefits. Other drivers of the trust fund imbalance include an aging workforce and population — aging workers are more likely than their younger counterparts to develop a disability — being replaced by fewer young workers. The result is a disability program that simply pays out more in benefits than it generates in payroll taxes, stressing the trust fund that is responsible for covering the difference. The fund takes in revenue when the Social Security program accrues more in payroll taxes than it doles out. At the beginning of 2014, there was $90 billion in the disability trust fund, but by the end of the year that had dwindled to $60 billion. Without a congressional fix, it’s not expected to last beyond next year. Exacerbating this is that in 1983 the Social Security retirement program was on the brink of insolvency. Congress stepped in and cut the disability program’s share of the payroll tax in order to stabilize Social Security. At the time, the disability program was in good shape, but by 1994 the tables had turned. So Congress OK’d a one-time transfer to the disability program, giving itself more time to enact a long-term solution. But Congress hasn’t acted since to fix the imbalance. And Congress can’t necessarily look to the retirement program to bail out the disability side. Social Security trustees estimate that the retirement program will be able to pay full benefits until 2035 (compared with 2016 for the disability program). After 2035, the Social Security Administration will only be able to pay 79 cents for every $1 of promised benefits. In the 22 years since Congress last tinkered with Social Security, few legislative fixes have emerged to ensure the financial health of the disability and retirement programs. U.S. Rep. Xavier Becerra, D-California, earlier this month proposed a merger of the retirement and the disability trust funds to prevent a benefit gap. But even a combined Social Security trust fund would still only remain solvent, at current projections, until 2033. The Congressional Budget Office last year examined measures available to lawmakers to shore up the long-term financial health of the two Social Security programs, including an increase in the payroll tax and subjecting more income to the payroll tax. — Raise the payroll tax. Social Security collects a 12.4 percent payroll tax, half of which is paid by workers and half by employers. Self-employed workers pay the full amount. To balance the disability and retirement programs, the payroll tax would need to increase 3.5 percentage points to 15.9 percent. So a worker earning $50,000 a year would pay an additional $900 each year, with the employer chipping in an additional $900. A self-employed worker would pay an additional $1,800 a year. — Increase or eliminate the maximum of earnings subject to the payroll tax. Right now, high-income workers pay the payroll tax only on their first $117,000 in earnings, tapping into 83 percent of wages. According to the CBO, if Congress raised the earnings ceiling to cover 90 percent of wages, workers would be taxed on the first $241,600 of income, which would increase revenue for the trust funds by 10 percent. But merely increasing the amount of earnings subject to the payroll tax won’t balance the trust funds. Payroll taxes would need to be raised 2.3 percentage points in that situation to strike a balance. Even if the maximum for taxable earnings is simply eliminated, subjecting all earnings to a payroll tax, a tax hike of 1.6 percentage points would still be needed to ensure the financial health of both the retirement and disability programs. — Increase the disability program’s share of payroll taxes. About 85 percent of payroll taxes collected fund retirement benefits, leaving only 15 percent to cover disability. So some, including President Barack Obama, want to increase the disability program’s share. This, however, would not be easy because Congress made a rule change on Jan. 6 that essentially blocks a mere reallocation of payroll taxes to the disability fund. Essentially, it was an attempt by Congress to force itself to find a solution. The House Ways and Means Committee began soliciting ideas for potential fixes July 9. With the clock ticking, Social Security trustees say even if Congress develops a long-term fix, it might not take effect soon enough, making a reallocation still necessary in the short term.